— that’s at the end of an article on the Rosenzweig et al study published recently in Nature on the impact of climate change on plants and animals. Presumably New Scientist have put this in as a counterpoint. It is very misleading though. No “this is only an experiment” or “not everyone agrees with this result” etc. and i always thought New Scientist was a good magazine. just goes to show how messages can get distorted very easily. I like to think for myself and hypothesize what would the Earths climate be like if Mankind did not exist. We are in a warmer interglacial period would I therefore expect the climate to be warming, to be stable, or to be cooling? Would I expect Glaciers and ice coverage to be reducing, to be stable, or to be increasing? The information I would really need to know, I think, is whether, the non mankind influenced, inter glacial period had reached its maximum or not and was now in decline. Therefore, when you put mankind back into the equation how can anyone postulate that mankind is having any influence either way? Alan, if you want “for certain” you need either the mathematics department or a religion — they’re the ones who can prove statements beyond any doubt, as long as you accept their basic assumptions. Science doesn’t offer that kind of certainty. Do you ever gamble? Fly on an airplane? Use a device with a semiconductor in it, like a laser, CD player, phone, or computer? Those are all matters of probability, not certainty. If you’ll accept the level of likelihood we use day to day in using science and what’s developed from it, you can have a very good likelihood of an accurate answer. Interested? Read more. Try the “Start Here” link at the top of the page. Put any term or name you read about elsewhere into the Search box. Oh, and consider just looking at the pictures. Remember chlorofluorocarbons? hair spray? refrigerants? the ozone hole? Those also are greenhouse gases. So, yes, it IS possible to do what you ask, figure out what difference human contribution makes. And, yes, it IS possible to do something about it. We already have. So what would your guesses be for the Earths current climate if Mankind didn’t exist? 103. Careful. Paradigm shifting. Dichlorine peroxide break-down rates not as previously understood. Science consensus being called into question, as invariably happens throughout the history of science. TBD whether Montreal has proven to have changed much. Hank, the relative/historical forcings set me back abit. A question out of right field: what happened to the 30-50years it takes (took?) for a CFC moleculae to make it to the stratosphere? Rod, if you would check your own beliefs before posting them as assumed truths, it would save me a lot of unnecessary typing. I’m trying to teach you how to be a good skeptic, you know. Trust me on this. You -can- get there. I’ve got to go spend time helping inlaws with a sick kid for a few weeks starting soon. Standard question — what’s your source? Why do you believe the number? Where did you get it? I did a Google search for “30-50 year” and — lo, are we surprised? — find that in posts from the people still claiming “the ozone hole is a fiction” on blogs. Nothing in any science sites I found — got any other source for the notion you have? That suggests five to seven years would be about right, though it’s an early and optimistic post, things didn’t work out that well. A little more searching (you can figure out the terms, the minus sign rules out terms you don’t want, like “ocean” in searching). OK? Three minutes. You _can_ do this. Now, the thinking part. Dang “wisdom” button still not programmed. What was that graphing? Global warming potential. How big is the GHG potential of chlorofluorocarbons? You can look it up. I trust you. Thinking it through, where do greenhouse gases operate? “Whevever they want to sit.” As they say about the 800 pound gorilla. The time lag getting to the stratosphere has no relation to the greenhouse warming potential of the chlorofluorocarbons. Yes, they persist, they do over time (not that long either) reach the stratosphere where they also catalyze ozone breakdown, that changes ozone levels, and that has a greenhouse forcing effect — but that’s a different aspect of their chemistry/physics than greenhouse gas-ing. Alan, if mankind didn’t exist — or if we’d invented something better than burning coal and hadn’t started the current experiment? Well, look at the past. This may help; the black line goes vertical at the right margin, note the arrow labeled “2004” pointing to where it was at that time. The last 200 years are in the tiny little bit of the chart right of the tickmark. and what did they base that, or those, functions and or equations on? All computers,computer modeling included, are subject and constrained to the limits of programmer and program itself. The math go to string inputs contained within the programming. I’m new here. Have only been folowing the AGW debate for a little while so please excuse me if my question has been answered already. I’m definitely on the fence. It sure is fasinating! My question: Does RC believe that increases in C02 leads or follows increased temps? The five year average at the end of the 1930’s and the five year average in the mid 1990’s is only around .2 degrees different but CO2 is up over 20% between those times. I’m not saying it was as warm as it is now in the 1930’s and I’m not denying that the difference right now is closer to .4 degrees from the 1930’s. I am just asking for an explanation of why raising CO2 over 20% didn’t create more warming than it did. Google and climate change. You have done a good job replying to #90. Just one comment. You have advised John to use Google and your examples may have been good ones for doing that. The trouble is that he may have started with Google as his main source anyway. He might come back at you with ‘Google solar changes’ or some such. Using Google with discrimination is a skill which needs to be learned and is perhaps hard to teach. I am beginning to despair about Google when it comes to this subject. When Channel 4’s Great Global Warming Swindle came out in the UK I was surprised to receive enquiries from graduates who decided to check up on the programme by using Google and immediately found it to be confirmed. This is of course one of the arguments for the existence of Realclimate but some people (especially those who don’t like authority) end up by being completely confused. Whereas the world wide web used to be mainly a means of sharing science and other academic material it has become joined at the hip with the media in general and is now open to purchase by those with money to spend. Since Google Scholar may be too technical it might be possible to use more specific suggestions like giving the whole link,Googling for the subject + Wikipedia,or + the Met Office etc. or Googling for a named person or group. If this sounds like censorship I would argue that I am not arguing for anything as absurd as a ban, just a bit of guidance. No one would recommend say the UK’s Telegraphs (Daily and Sunday) as sources for information about climate even though the Telegraphs do report on the subject in between articles by Christopher Monckton. No criticism of #93 intended. plus water vapour and sensible heat – I wonder whether the models include these? The IPCC argues that these effects completely swamp solar ones, on two main grounds: first, the rate of warming in the latter half of the 20th century exceeds all previous experience; and second, otherwise their models don’t make sense. The second “argument” is something you made up. The IPCC doesn’t say anything of the sort. Have you actually read the AR4 report? Why don’t you do that before telling us what it says? unpublicised revisions to the US temperature record reveal that six of the hottest ten years occurred in the first half of the 20th century. What “unpublicized revisions?” Are you making stuff up again? And what makes you think US continental temperature records, or central England temperature records, reflect what’s true for the whole world? Do you understand what an ‘average’ is? I would also like a climate scientist to confirm that, in and of itself, CO2 would block no more than 0.04% of out-going infra-red radiation. where C is present or end concentration and C0 is reference concentration. (C/C0) according to you is 1.2 for the period in question. 5.35 ln 1.2 = approximately 0.98. Using a climate sensitivity of 0.75 K/W/m2, that translates to 0.73 K. The actual rise was 0.4 K.
I suggest that the discrepancy is probably due to the massive release of anthropogenic aerosols which caused the cooling in the ’40s and has created a negative temperature feedback since. You would only need a cooling of 0.33 K over 70 years to match. #92Thank you, Phil Fenton. I have difficulty with the notion that any matter making up a proportion “x” of a medium can intercept a proportion “250x” of waves passing through the medium. All waves would pass through an atmosphere comprising only N2 or O2. No waves would pass through an atmosphere comprising only CO2. But, you imply, less than half the waves (much less, perhaps zero)would pass through an atmosphere of half CO2 and half N2 or O2. Why is this so? On the other part of your answer to my query, I take it that heat would be transferred from CO2 molecules to N2 and O2 by conduction? And that this would raise the intensity of radiation from the atmosphere to the surface? Perhaps you should read up on light absorption and spectroscopy then! Ever heard of an emerald? It’s a gem composed of the transparent mineral beryl, it looks green because all the blue and red light is absorbed by an impurity, chromium, which is present at less than 1%. No because only those wavelengths between ~13 and 17 microns will be absorbed by CO2, in that band almost all will be absorbed within a few meters. John Millett, I find it more illuminating to think of it this way. Imaging a photon of wavelength roughly 15 microns propagating upward through the atmosphere. If it encounters a CO2 molecule during its ascent, it is likely to interact with it and excite the vibrational state, right? So what is the probability that it will encounter a CO2 molecule? CO2 constitutes 385 ppmv, which is about 600 ppm by mass. A COLUMN OF AIR 15 MICRONS IN RADIUS weighs roughly 7.2 mg. That means there are roughly 59 trillion CO2 molecules encountered by every 15 micron photon on a straight-line path out of the atmosphere. The photon is, effectively, a sitting duck. Moreover, the lifetime for radiative decay of the corresponding excited vibrational state is of order microseconds, so the state is much more likely to decay collisionally than radiatively. It thus imparts energy to N2 and O2, Ar–the whole atmosphere. Thus, the chances of an IR photon in the CO2 energy band are pretty slim until the radiation occurs high in the atmosphere. As to radiation transfer–within the atmosphere there are many ways energy can be transferred to the surface. It’s not just radiation. Experiment: Try a mixture of one part of potassium permanganate and 250 parts of water. Theory. Since the oxygen and nitrogen are transparent to infra-red they might as well be ignored, at least for the first absorption. That would still leave a large number of closely spaced CO2 and H2O molecules. If you are thinking of radiation from oxygen or nitrogen that would be negligible because a zero absorber is also a zero radiator.This is an application of laws discovered by Kirchoff, Angstrom (the older one) and I believe Rayleigh. Hank, Carl Sagen, of global warming and global winter fame (among other stuff) said 50 years. I recall reading also a number of years back as much as 100 years for CFCs to make it to the stratosphere. I assume the science and our understanding have improved since then, as opposed to, say, burying it as “downright embarrassing: ;-). It still seems a little tough for the very heavy CFC molecules to get to the top of the troposphere and then through the narrow gate of the tropopause in a half-dozen years. But, as you say, it’s just a thought; I have no studied reason to dispute it. Actually the answer to my ill-posed (as it turns out) question was the transit time to the stratosphere has little to do with CFC greenhouse gas potential. Though that potential blew me away (new news for me). Good luck with your helpful sojourn. Ray (117) good analysis that I will explore thoroughly with your start. But you left me hanging with, “…As to radiation transfer–within the atmosphere there are many ways energy can be transferred to the surface. It’s not just radiation.” Which might be true, but my long-standing question is what is the source of the massive IR radiation from atmosphere to surface? # 120 Usually when a scientist asks for a reference they don’t mean an unsubstantiated claim that some famous person said it. They mean a published result in the literature. Having such a source (like the one Gavin provided) doesn’t in and of itself mean that the number is correct. What that really does is provide a hook into the literature that one can use to ascertain whether a particular result is in the right ballpark by looking to see if the result in question is pretty well accepted in the literature or if there is substantial dispute within the literature. The time for CFC’s to reach the upper atmosphere seems like a relatively straightforward thing to measure. It is unlikely that it is in dispute. I expect that in all probability you are misquoting Sagen and incorrectly remember your reading from “a number of years back”. Alan Millar (102) — The peak of the Holocene interglacial is long past. Without humans the climate would be slowly cooling towards the next attempt at a stade (massive ice sheets) in about 20,000 years. It will _really_help_ you to read Spencer Weart’s book, first link under Science, right hand side of the RC page. You’ll ask better questions, knowing the basics. The effect of the CFCs is among those discussed there. I just want to thank everyone who works to keep RC up and running – it’s a wonderful resource! Rod, I didn’t mean to imply that there is no radiation from the atmosphere to the surface, merely that that is not the only energy transport mechanism. CO2 or H2O molecules near the surface can and will radiate at their blackbody temperature–again equilibrium. However there are other transport mechanisms for energy to make it back to the surface. #93 Thank you, Jim Eager. Apart from the abnormal climate change events you mention, the numerous oscillations between ice ages and inter-glacial warming periods also express natural causes (most likely related to solar impacts of one kind or another – if not, what else?) making the case for AGW dependant solely on the unprecedentd rate of current warming. Suitably chastened, I looked at the revised US data you helpfully posted and found they make an interesting pattern. The hottest 25 years in the record occurred over 107 years from 1990 to 2007 and show a slight warming trend. Trimmed of the three observation greater than an anomaly of 1.00 and the two less than 0.6, the remaining 20 span the 76 years from 1931 and show an even slighter warming trend. That there is a warming trend in an inter-glacial period is unsurprising: that it is so slight, given the AGW hypothesis and the rapid increase in CO2 emissions over the period, is surprising. John, the USA has been on the low side — that fits what the climate models suggest will happen, given the ocean and atmospheric circulation. If I understand the science behind climate sensitivity correctly, with a climate sensitivity of 0.75 K/W/meter squared there’s approximately 0.4 to 0.6 K of warming in the pipeline. That extra warming would become apparent if the climate were allowed to reach equilibrium without further forcing. So the observed rise of 0.4 degrees coupled with the warming in the pipeline (of at least 0.4 degrees) would be more than enough to equal the amount due to greenhouse gas forcing, even with some of the temperature rise masked by aerosols, wouldn’t it? and have a look at the way the remaining multi-year sea ice of the Arctic is peeling away from the Canadian Archipelago. Bets? A sure thing, more likely! #100 Thank you, Ray Ladbury. I’ve got the message on the abnormal climate change events from Jim Eager, as well (#93 and my response #107 (awaiting moderation)). “Are we talking IR radiation or IR photons?” Ray, I thought they were much the same thing; but if not, I don’t think I want to go there – it’s bound to be too complicated. “How do you give a single molecule a temperature?” Courtesy of #92, by placing it in the path of a particular wave length of IR radiation. Chastened again, I’ve gone to “CO2 in 6 easy steps” where step 1 made me wonder, unmasking a simple (and ancient) engineering background, whether a water reservoir was analagous to the atmoshere? Pumping water into a reservoir at a faster rate than it is draining out results in the reservoir overflowing. What happens to all those watts accumulating in the atmosphere as the surface pumps in energy at 1.6 times the rate at which it escapes to space? #117 Ray, what you didn’t tell me is that as well as the 59 trillion photon-gobbling CO2 molecules in the air column there are 98 quadrillion photon-friendly molecules of N2 and O2. The probability of the photon escaping to space is 0.9994, no? … that translates to 0.73 K. The actual rise was 0.4 K.
Mostly correct, I think. Note that 0.73K represents equilibrium warming; what we want is transient warming, only about half of that, the rest going into long term ocean warming. I don’t think we need aerosols here to make the books close (and the large aerosol cooling effects are mostly for the period 1940-1975 anyway). Ken and Martin — good point. I had forgotten that the RF in the Myhre et al. equation was for equilibrium warming, and that some warming is still coming. Is it possible for the ice cap/sheets to melt (completely) in the north and build in the south? What effect could this have on earths orbit/rotation/climate? Yes, it’s possible. Right now the far north is warming faster than any other region of the planet, but the far south only very slowly. I doubt there’d be any effect on our orbit, but I recall (don’t recall where) seeing statements that the re-distribution of mass due to ice melt can affect earth’s rotation. If I recall correctly, it’s expected that mass will be transferred equatorward, which will slow earth’s rotation but only by a tiny amount. Again, I doubt that the miniscule change in rotation rate will have a noticeable climate effect. This is all speculation on my part. John (132), a quicky minor clarification. A photon absorbed into vibration energy of CO2 does not raise its temperature. Though this is mostly academic as it turns into higher temperature when it collides with another air molecule. Two, I don’t think you can call N2 or O2 photon friendly. Natural, yes, and initiated by changes in solar insolation, yes, but not as a result of variations in solar output, rather as a result of changes in Earth’s orbit, tilt and wobble of axis. See Milankovic Cycles from my post 93. But CO2 (and methane) emitted by thawing permafrost and tundra bogs, and CO2 emitted by a slowly warming ocean then amplifies the insolation induced warming. Not at all. The case for AGW rests on multiple lines of evidence, but most fundamentally on the known radiative physics of CO2 and other greenhouse gases. If CO2 from a warming ocean naturally causes more warming, then CO2 added directly to the atmosphere from fossil fuels will cause more warming. Add to that the fact that fossil fuels have a low ratio of carbon 13 to carbon 12, and that the ratio of 13C to 12C in atmospheric CO2 is dropping as CO2 concentration is rising, means that the increase must be from burning fossil fuels. John: “Trimmed of the three observation greater than an anomaly of 1.00 and the two less than 0.6, the remaining 20 span the 76 years from 1931 and show an even slighter warming trend. Not necessarily overflowing, but definitely rising. Yes, a reservoir (or bucket, or bathtub) with different outlet levels is a useful analogy. When the water level (temperature) reaches a new outlet or hole the outflow will once again equal the input, but the level (temperature) will be higher. The elevation at which IR photons are more likely to escape to space than to be absorbed rises, the atmosphere warms, the warmer atmosphere and back radiation warms the surface and ocean. John: “Ray, what you didn’t tell me is that as well as the 59 trillion photon-gobbling CO2 molecules in the air column there are 98 quadrillion photon-friendly molecules of N2 and O2. The N2 and O2 molecules are transparent to the photons, but they are energised through collision with the excited CO2 (and H2O) molecules. Thank you for taking the time to answer my question. I’m starting to see just how complex this issue really is. John Millett, Not to bring back unpleasant memories ;-), but remember back to you modern physics class–an atom or molecule can only absorb radiation with an energy equivalent to the difference between two states of the atom/molecule. O2 and N2 being diatomic, do not have any rotational states or vibrational states that will absorb in the IR. Far from being IR “friendly,” they don’t even wave as the photon goes whizzing past. Ah, but you will ask, what about water vapor? A wonderful greenhouse gas, but 1)water vapor content of the atmosphere has not changed significantly (CO2 has increased by 38%) and 2) water vapor peters out at the cloudtops, while CO2 is well mixed (and continues to work as a ghg and absorb IR) up into the stratosphere. My point about whether you were talking about photon numbers or energy is not that complicated–the energy is just the integral of photons at a given energy times the energy integrated over the range of interest–that is, the first moment wrt energy. And your instincts are pretty good–the mathematics are similar to the “hole in my bucket, dear Liza, dear Liza” problem. As long as energy in=energy out, you have equilibrium (by definition). Now if you stop some of that energy leaving (and the only way it leaves is as blackbody radiation peaking in the IR range), things have to warm up, and they will continue to warm up until the energy of the outgoing radiation (mainly that outside the absorption bands of the greenhouse gasses) is equal to the incoming radiation. Does that make sense? Haven’t you gone a bit too far in downgrading the importance of water vapour? A casual reader might conclude from these remarks that positive feedback from water vapour is of no importance. Since the water vapour ought to go up at a rate of 6% per degree C there must already been an increase in H2O thus contradicting your point 1). I thought that this had also been confirmed by observation. Furthermore at high altitudes the spectra of water vapour and CO2 act as distinct lines which implies that the radiation from the highest H20 molecules ought to reach the top of the atmosphere without further absorption by CO2. Isn’t that right? But the stratosphere is cooling, not warming. What altitude is “high”? What’s your cite on this? Geoff, Thanks for correcting any misimpression I might have left. Yes, as temperature rises, water vapor content does act as a feedback. My point was that water vapor could not be the driver. I believe that even high in the atmosphere, there is overlap between CO2 (15 micron band) and water vapor spectra. It does look like it from the spectra I’ve seen, but I’m sure Gavin or somebody else will correct me if I am wrong. Sounds like a dubious remark to me. If you plug the original temperature into the standard equilibrium formula it would tell you that the molecule is probably not vibrating i.e. you have made an error. The definition of temperature here is mainly a matter of terminology. From some standpoints it might be convenient to define a raised effective temperature. The main point is to keep tabs on where the energy is gone and how it is shared out between the different degrees of freedom. Improved physics theory and precise laboratory measurements in the 1940s and after encouraged a new way of looking at the absorption. Scientists were especially struck to find that at low pressure and temperature, each band resolved into a cluster of sharply defined lines, like a picket fence, with gaps between the lines where radiation would get through. (24) The most important CO2 absorption lines did not lie exactly on top of water vapor lines. Instead of two overlapping bands, there were two sets of narrow lines with spaces for radiation to slip through. So even if water vapor in the lower layers of the atmosphere did entirely block any radiation that could have been absorbed by CO2, that would not keep the gas from making a difference in the rarified and frigid upper layers. my uncle sent me this. is this global cooled 0.7C in 2007 ..is this number real or relevant or meaningful? who was an editor at the National Climate Center in Boulder Coloado. Run it for CO2 & H2O between 600-700 cm^-1 at a pressure of 10mbar. For those who want global warming to increase temperatures every year, do you think the average temperature every year would be constant without an external impulse? If not, you have to consider how a long-term warming trend would look if you superimposed it on short-term variations. 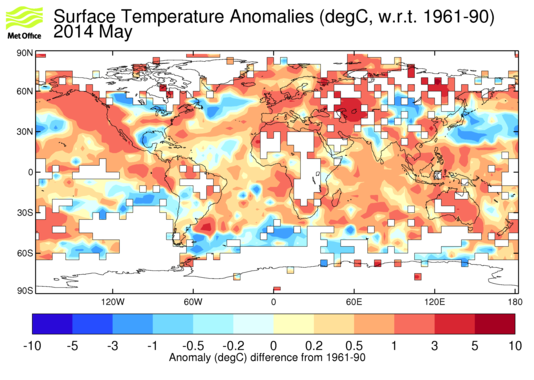 My approach to this was to look for a period in the temperature record where there was no discernible long-term trend, the first 50 years of HadCRUT3 (1850-1899). If you look at this data, you will see that the variation between the maximum and minimum annual average is over 0.5°C with variations of over 0.4°C in as little as 2 years. A linear regression shows a trend of warming of 0.08°C per century with r2 = 0.0124. What would have happened if you had superimposed today’s level of CO2 forcing onto that situation? You would have had a long-term trend of increasing temperature and the odd patch where the trend was flat or even down. See http://opinion-nation.blogspot.com/2008/04/why-doesnt-it-get-hotter-every-year.html for more detail (comments and corrections welcome as always). Given that I artificially forced this trend onto data which didn’t have a significant warming trend before, this is some indication of why you shouldn’t expect to see a monotonic increase in temperatures under today’s conditions. The only way I would expect that to happen would be if the warming signal was above inter-annual natural variability. Given that we are talking about a trend which is accelerating to around 3°C per century, or only 0.03°C per year, it’s not surprising that every year is not warmer than the last.